Make the marinade: In a 9-by-13-inch glass (nonreactive) pan or large bowl by combining the yogurt, lemon juice, garlic, ginger, cumin, coriander, cayenne, turmeric, cardamom, sugar, salt, and pepper. Whisk the ingredients well and set aside while preparing the chicken. Remove and discard the skin from the chicken. Rinse each piece under cold running water and drain well. Thoroughly blot dry with paper towels. Make 2 to 3 deep slashes (almost to the bone) in each piece and add to marinade. Turn the pieces to coat well and refrigerate 4 to 6 hours or overnight. Make the sauce: Put the oil in a wide saucepan with a lid over medium-high heat. When hot, add the onions, stirring and frying until they turn reddish-brown, about 8 minutes. Add the garlic and ginger and continue to fry, stirring constantly, for one minute. Add the coriander, turmeric, paprika, and cayenne. Stir for 30 seconds before adding a spoonful of yogurt. Stir and fry until the yogurt is absorbed. Add the remaining yogurt in the same way, a spoonful at a time. Add the tomatoes and fry 3 to 4 minutes or until they are pulpy. Use the back of a wooden spoon to mash them and help the process along. Add the tomato juice, chicken stock, sugar, and salt, and bring to a simmer. Cover, reduce the heat to low, and gently simmer the sauce 15 to 20 minutes; it will become thick. Add the garam masala and cilantro and taste for additional seasoning. Lightly oil one side of the grill and preheat it to high. Once the grill is hot, remove the chicken from the marinade, wiping off any excess. Arrange the pieces on the oiled side of the hot grate and grill, turning with tongs, until the chicken is nicely browned on the outside and the juices run clear when the tip of a small sharp paring knife is inserted in the thickest part of the leg or thigh. The total cooking time should be between 8 and 10 minutes per side, 16 to 20 minutes in all. Add the cooked chicken pieces to the sauce and coat completely. Continue to cook until they are warmed through. 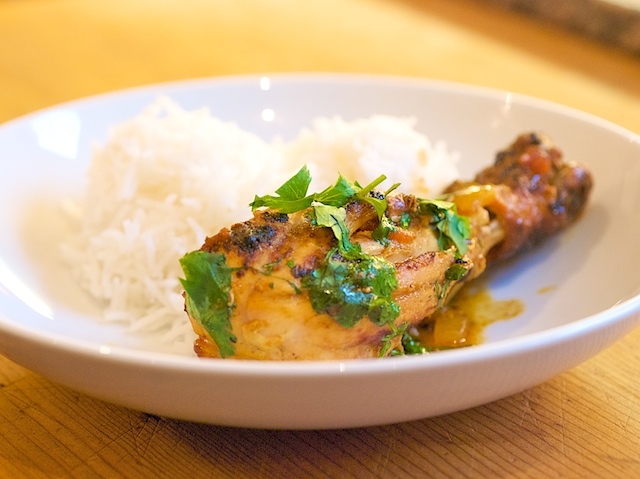 Serve with freshly cooked basmati rice or naan. Culinate editor's note: Double or triple this recipe; it makes a great dish for feeding a crowd.